Today I am introducing a new series highlighting individuals who are creating media or marketing products with positive messages for children and youth, and individuals using their creativity to promote media literacy among the young. Since we are here on the cusp of the official start of summer, and since The National Council on Skin Cancer Prevention has declared today “Don’t Fry Day,” I thought I would start with TGR Body sunscreen, created by Tracee Sioux. Tracee Sioux is a nationally recognized gender and parenting expert and writes The Girl Revolution, a website about parenting daughters. I prefer that second one, too. 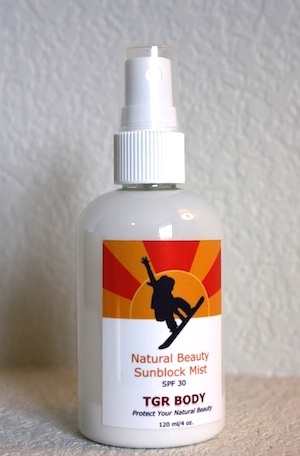 Ms. Sioux sent me a sample of Natural Beauty Sunblock Mist, which features a silhouette of a girl snowboarding. I liked it a lot. It felt nice going on, didn’t leave an unpleasant film on the skin, and it wasn’t all perfumy. Now you might assume I was biased and wanted to like this product, and I was. So just to be sure I wasn’t imaging things, I shared it with a couple of other people on a sunny, snowy day in February in Vermont. I didn’t tell them anything about it. It got positive reviews all around. Certainly it’s worth a try – especially right now, since she’s offering free shipping. This is so encouraging! Thanks for sharing. Thanks, Jennifer! I can't wait to get to the next one. And thank you for the wonderful media literacy work you are doing on your blog. Hey! You beat me to the punch with our positive picks series! ha. I'm in love with the TGRBody packaging look and bold/healthy girl approach, so when we were out with the skiboat and a pile of teen girls this afternoon I said to myself, "Memorial Day, water's up, time to get Tracee's post ready…sun-n-fun with summer comin' soon" Pulled out my file to ask her a bunch of ingredient Qs, since I just finished reading "Sunscreen Caveat Read Those Labels" on UVA stuff in the Chron Wednesday. http://j.mp/mqySPJSo, Tracee, what say you? Holds up? I know you were going for EWG style standards, etc. so am planning on springboarding off their new 2011 release…congrats on this great coverage, and Erin as always, you rock. Hi Amy, I was just reading about the Environmental Working Group's new report about iffy ingredients in sunscreen. Pretty scary. Thanks for mentioning that.